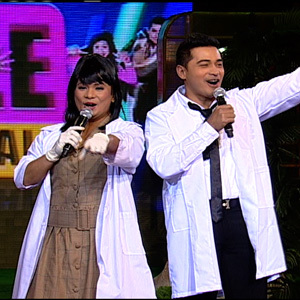 Ogie Alcasid (left) plays Doctor Tordok while Cesar Montano plays Doctor Rizalino in this week’s episodes of Hole In The Wall. Actor Cesar Montano becomes the special guest co-host of singer-comedian Ogie Alcasid in GMA-7’s outrageous game show, Hole In The Wall. Until September 24, Cesar as Doctor Rizalino, joins Ogie as Doctor Tordok in cheering on teams of players as they twist their bodies through oddly-shaped walls and bring home the jackpot money. Today (September 22), two celebrity teams test their brains and brawn against the oversize walls. Whose bodies will be dunked straight to the pool at the end of the game? Is it the Blue Team of Maureen Larrazabal, Jay Norman Justiniani, and Ruben Caballero, or the Red Team of Aira Bermudez, Papa Dan and Papa Jepoy? And on Thursday and Friday (September 23 to 24), regular contenders will get a chance to squeeze their bodies through moving walls of various sizes and shapes. Hole In The Wall airs Monday to Friday, before Bantatay on GMA-7.